EACH DAY in AMERICA there are 31 murders, 55 suicides, 2 accidental deaths, 1 death by police action. If not killed, 219 injured by guns each day. 89 deaths by guns each day. 32, 514 people are killed by guns each year. $627 million costs in a year. What is the cost of gun violence? 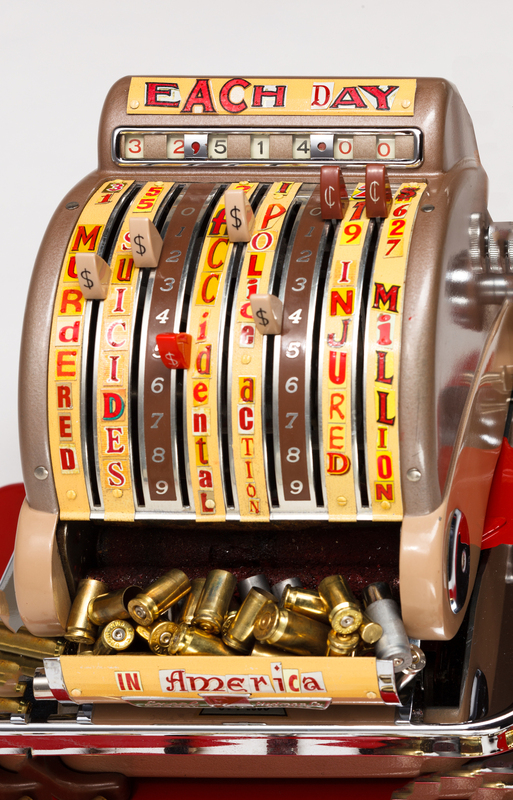 Research for “Checking the Cost of Gun Violence” revealed astonishing statistics. One source calculates that every citizen in the US is effectively writing a check for $700 each year to cover the nationwide cost of gun violence. Is there any way that we can reduce or check the prevalence of gun violence? Each year, the U.S. spends $2.8 billion treating gunshot wounds in emergency room and hospital charges in the United States each year. "Gun deaths are this nation s third-leading cause of injury- related fatalities, with the most recent data showing that firearms accounted for more than 36,200 deaths in 2015. Over a nine-year period, according to data from the Centers for Disease Control and Prevention, almost 971,000 people were hurt or killed by firearms in the United States with a just-released study finding that such injuries cost nearly $25 billion in hospital emergency and inpatient care from 2006 to 2014." A gun in a household doubles the risk of homicide and triples the risk of suicide in that household. The 89 shell casings from bullets represent the number of deaths each day to gun violence in the United States. This statistic was from several years ago. I don't understand how we continue to see these mass shootings in the news without any changes in our gun laws. Materials: Check writing machine, gun, 89 shells from bullets, recycled tin, paint, silver, screws. This artwork is included in the exhibition titled Imagine Peace Now. Do guns deter crime or enable violence? Can we reduce or check the prevalence of gun violence? Check the evidence! Click on either of these postcard images (above) to see installation shots at East Carolina University School of Art and Design. This exhibition was organized by Boris Bally. Purchase this beautiful full color catalog for the exhibition I.M.A.G.I.N.E. Peace Now. 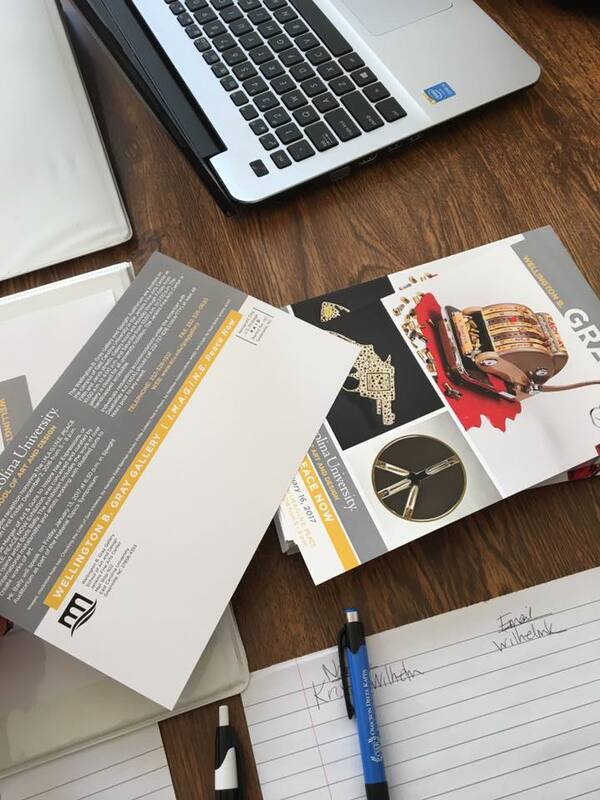 Every artist in the traveling exhibition is included in the catalog. Click on the images in this gallery for a description of this sculpture in progress. The drawing was an attempt to visualize the artwork. Original sketch by Aryn Shelander was made during a discussion with the artist Harriete Estel Berman. 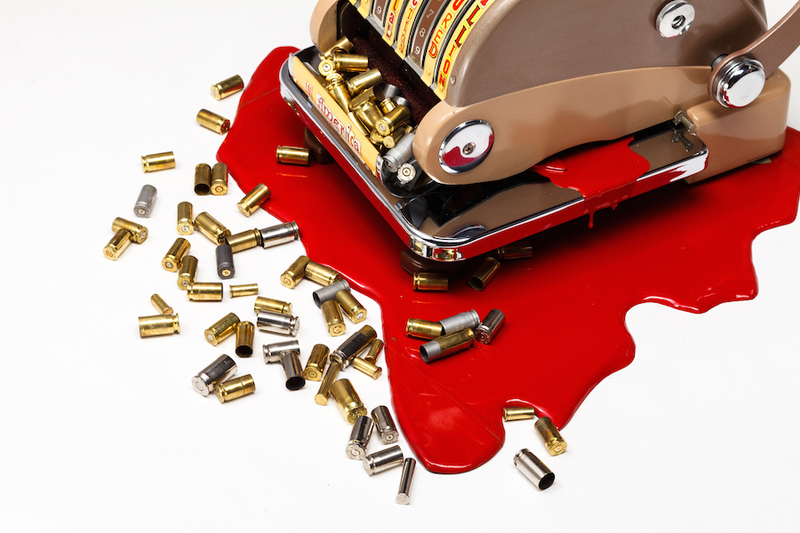 This is when it was decided to make a platform of blood for the checking writing machine. I think it adds a lot to the visual impact and immediate message behind this sculpture. Gun from buy back program given to the artist for artwork about gun violence. 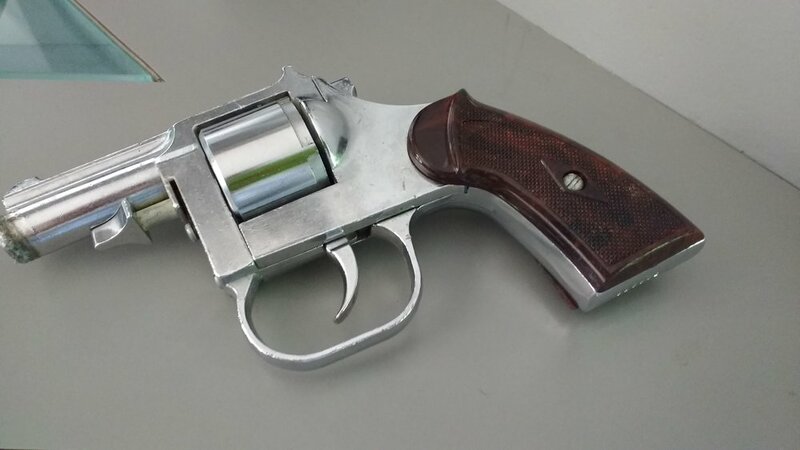 This is the original disabled gun from a Pittsburgh gun buy back program. 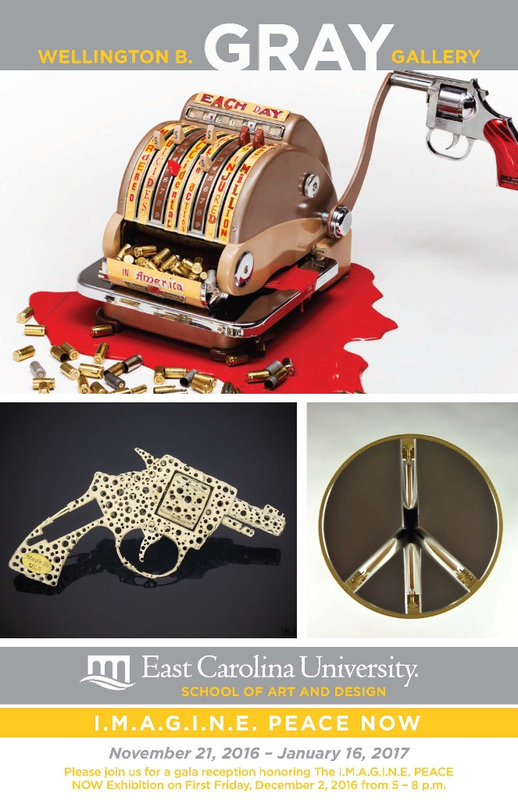 It was randomly selected by Boris Bally and sent to me for making an artwork about gun violence. Check writing machine was the core of this sculpture. The check writing machine was discovered at a estate sale. As soon as I saw it, I had the answer to what I was going to make with the gun. The chrome edge on the machine, along with the chrome platform and immediate association of guns with money were a perfect analogy. Note that the vertical panels had blank spaces that were perfect for adding statistics about the cost of gun violence. Testing how to get the gun on the handle. There was endless debate with my in-house critics (my family) about how to attach the gun to the handle. While there were several possibilities I went with my original vision (shown in the sketch.) Turns out it was incredibly easy to attach the gun instead of the handle. In this photo, I am testing how to get the gun on the handle. Working on one piece always adds something to the next. If you check out the 10 Modern Plagues I had just learned to roll the edge of the Hebrew lettering. This new skill was perfect for this blood. The chrome details and platform on the check writing machine matched the chrome plated gun perfectly. Adding the blood (red paint) added a graphic impact. 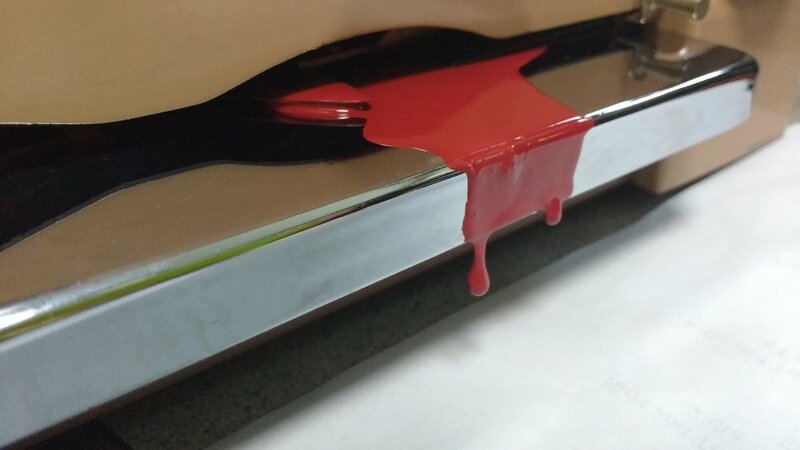 Blood on the check writing platform looks like it is oozing out of the machine . The little metallic arrow was original to the machine as a way to align the check for printing. The "blood" you see here is paint. Bermaid label on the back says that it was made by Harriete Estel Berman. Bermaid is a pun on my name Berman - not a good name for an avowed feminist. Since my name ends in "man" I changed it to "maid" referring to the fact that the work is made by a woman, and made by hand. I needed shell casings as a final touch for the artwork, yet finding shell cases was a really scary problem. I didn't know where to go, and was very uncomfortable going to a shooting range. Purchasing bullets was out of the question as I wanted spent bullet casings to represent the deaths caused by gun violence. The shooting range for the local and county police would not let me take shell casings off the property. Finally, I found a shooting range and they were very generous. The shell casings were very dirty with gun powder. I counted out exactly 83 and cleaned them all for the finished artwork. For some reason I saved the other shell casings. Fabrication of Checking the Cost of Gun Violence includes hydraulic matrix die form for fabricating a new gun handle grip from recycled tin cans. Traditional silversmithing hollowware skills were used to form the red recycled tin for pool of blood. (This is the original red finish on the tin can ans it was not repainted) Riveting for lettering assembly. Lettering is from recycled tin cans. Grinding and polishing to retrofit disabled gun to fit checking machine handle. Paint for blood on the check writing machine, tap & die. MarieClaire Magazine online has extensive statistics and articles about Women & Guns.